December 5, 2017 1:07 pm. 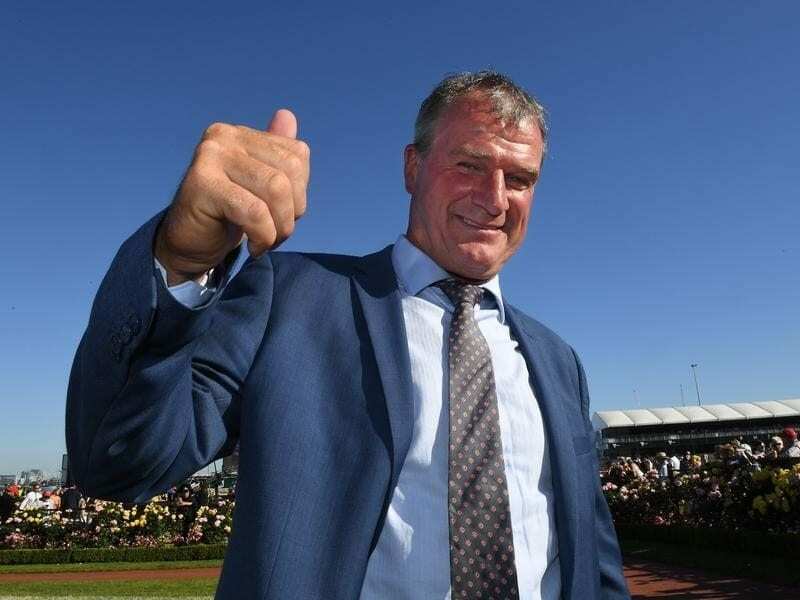 Darren Weir has given the thumbs-up to Black Heart Bart’s beach work ahead of his next G1 tilt. Working in deep sand has put Black Heart Bart’s season back on track and the gelding is now poised to start favourite in the final Group One race of the year. After a winless Melbourne spring when Black Heart Bart was battling a foot issue, he spent time at trainer Darren Weir’s new Maldon property in Victoria which has a deep sand track and complements his training bases at Ballarat and Warrnambool. Black Heart Bart showed he was still a force to be reckoned with when half a head second to Great Shot in the Group One Railway Stakes (1600m) in Perth last Saturday week, carrying top weight of 59kg. He is favourite for Saturday’s $1 million weight-for-age Kingston Town Stakes (1800m) at Ascot and Weir said the gelding was sound and looked terrific. “I think the horse is going great,” Weir told RSN927. “The horse is a very sound, tough horse but he was just having a bit of feet issues and we just were having of trouble keeping them right. “It was just concussion, really. We just weren’t able to get him into that heavier sand where there’s absolutely no concussion on their feet, really. “After his last run in the spring he went straight up to Maldon and had five or six weeks up there in the deep sand and he just got sounder and sounder each week. By the time he came over here (WA) he we was trotting out fantastic. Weir’s Maldon set-up is based on WA trainer Lindsey Smith’s property where Black Heart Bart is based for his Perth campaign. “Unfortunately the beach (at Warrnambool) has changed a little bit. The beach is still very good but we just don’t get the real deep sand that we used to get 12 months ago,” Weir said. “So it’s just hard with horses that have got a few little issues when you can’t quite get the deepness of the sand that you want, but it’s still very good.